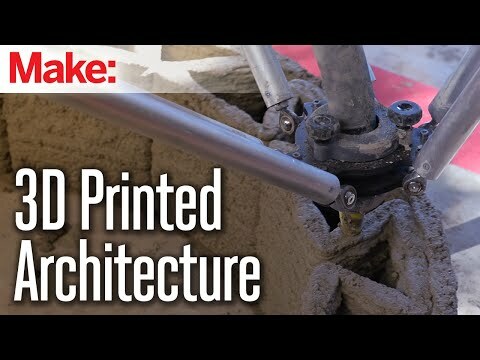 This 3D printer has been developed to build cheap, sustainable houses using a clay-like paste. WASP CEO Massimo Moretti explained to Make:, the magazine that produces the faire, that this allows developers to work more closely with natural forms, rather than the square-shaped block homes that common brick dwellings are made from. The mud that goes inside the printer first needs to be mixed with another natural fiber, such as wool, to help bind it together, creating a grainy paste that can then be squeezed out into the desired shape, sort of as though you were icing a cake. Although they may not look like much, these homes can be up to three meters high, and when dry create a tough and sustainable shelter for people in rural or impoverished areas. Instead of traditional foundations, the ones created by the WASP printer at the Maker Faire Rome used cleverly designed layers of the mud mixture to make the walls strong. “While no plans are officially in place, Moretti states that the first WASP house may occur next year in Sardinia, due to the availability of wool, used as a fibrous binder in the printer’s mud, for the project,” writes Mike Sense for Make:.